Keep your room cooler. This is one of the most obvious solutions, yet it sometimes gets overlooked, so I have to include it. To get a good night’s sleep, experts recommend keeping the temperature in your room down. For best results, you should be somewhere between 65 and 70 degrees Fahrenheit. Experiment a little to see what’s the most comfortable. Use a fan. I am a big fan (pardon the pun) of this tip, because I use a big fan in my bedroom. Here’s the model I use (link goes to Amazon. That model may be excessive for some people and rooms, but I like the power behind it). This will help keep your body temperature down and will create airflow to help pull the warm air through the mattress. 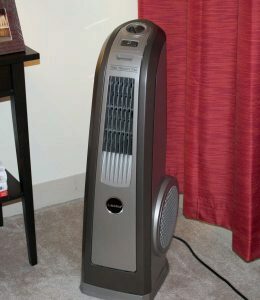 Furthermore, a fan acts as a source of white noise. On nights I use my fan, I don’t need my white noise machine. The Lasko 4924 “High Velocity Blower” as seen in my bedroom. It doubles as a source of white noise. Click on the picture to go to the Amazon page. Mattress protector. If you use a mattress protector (which I recommend), make sure it is breathable. Many of the cheaper plastic-y ones don’t breathe well, and can keep a mattress warmer than it should be. If you suspect the protector might be the culprit, remove it for a night or two to see if that helps. If it does, buy a more breathable protector. If there’s no change, put the protector back on. Sheets. Some sheets are more breathable than others. Flannel sheets are great at keeping you warm in the winter,for example, but that can be rough when it’s warmer. Cotton sheets tend to be hit or miss, depending on exactly what kind of weave they use. If the threads are woven too densely or they’re too thick, air can’t flow through as easily. Blanket, comforter, duvet. Make sure you’re using the appropriate thickness of blanket, comforter, or duvet. I personally like a thick comforter to go along with my cold room, but if you’re sleeping hot, you might need to switch to a thinner blanket. I saved the mattress for last, because it’s the hardest one to change. But, if you’re mattress is getting old anyway, it’s something to consider. Make sure your mattress has some kind of air flow. Things like convoluted foam (which is egg crate shaped), holes in the foam, and ventilated sides can help air flow through the mattress, pulling some of the heat from your body through the mattress. Innerspring mattresses generally have more air flow than foam mattresses, but an innerspring mattress with a thick foam layer up top can still have issues. Latex foam keeps a more neutral temperature. Latex foam can still get warm, but it warms up more slowly than polyurethane foams like memory foam. Additionally, it generally has small holes that run through the foam that can add more airflow. If you have a memory foam mattress that sleeps too hot, consider getting a latex topper to put some space between you and the memory foam. Phase change materials. This part is a little technical, but some mattresses have something called “phase change materials,” which are materials designed to keep the mattress a more neutral temperature. Instead of warming up or cooling down when energy is added or subtracted, the material changes phase (say, from a gel to a solid and back. This is the same principle as melting ice water. No matter how much you heat it up, until the ice is melted, it stays the same temperature). Phase change materials can also be found in mattress protectors. Gel, etc, in the foam. Some memory foam claims to sleep cool because it uses gel mixed into the foam. For the most part, this is a very minor effect that really isn’t noticeable. It may take very slightly longer to warm up, but that’s about it. Gel foam can have other benefits, like making the foam feel thicker or a little more supportive, but it doesn’t really keep you cool. If any mattress claims that it “sleeps cool” merely because it uses a layer of gel foam, be very skeptical about that claim. This is one of the most oversold new features in mattresses. Of all the mattresses that are designed to sleep cool, one that does it particularly well is called the Aurora by Brooklyn Bedding. You can read my review of the Aurora here. In conclusion, there are many possible factors that can keep you sleeping hot, and not all of it is the mattress. Your environment and your bedding also play an important role, perhaps even more than the mattress in some cases. Additionally, be very wary of the hype surrounding gel memory foam. It doesn’t make a big difference. The other factors overwhelm any benefit gained from mixing gel into the memory foam. Do you have any other tips or tricks that have worked for you? Leave them in the comments below. http://zafco.pk/ Being in great shape is actually a aim we need to all strive to obtain. Our physical fitness ideas will provide you with the most recent and very best information and facts, keep you inside the know and up to speed on what you should do. Our suggestions can help you achieve the fitness objective you might have always aspired to accomplish. http://www.aruanda.org/ You should begin residing with the slogan that "adequate is useful adequate" while you are coping with stress and anxiety. Should you carry on to try and strive for perfection, you can expect to put a lot more excessive stress on your self at one time when you are currently bombarded. Perform the finest you may at whichever you are doing, and stay happy with what you are able achieve. http://www.exclusivecocktails.co.uk/about-us/ In case you are truly near using a good friend, tell them regarding your issues with anxiety. It is essential to show the feelings that you need to somebody, so that you will will not truly feel on your own when going through difficult times. Make clear what exactly is bothering you and ask their suggestions on how to simplicity several of your worries. http://loveawake.ru/ - Знакомства Beichangtan. Сайт знакомств Beichangtan бесплатно, без регистрации, для серьезных отношений. Thanks for all of ideas, You make my life easier! I was thinking about punching small Holes in my memory foam topper (that's on top of a foam mattress) and then using a cloth to separate the main mattres and the topper and finally another cheap cloth topper on the top to help air flow so the memory foam doesn't retain as much heat.. that's my hope and theory. Has anyone else tried that? (I'm to boke to buy a topper or mattress).